The vast majority of adults (71 percent) feel that our sense of community is declining, new research shows. The research was commissioned to mark the launch of the Young Farmers’ Clubs of Ulster (YFCU) ‘Know Your Neighbour’ campaign in partnership with Calor. Seven in 10 adults feel that children today feel a lesser sense of community than they themselves did growing up in Northern Ireland. This rises to three quarters (75 percent) of adults living in urban communities. Similarly, not being familiar with neighbours is more prevalent in urban communities with almost one in six (14 percent) saying that they do not know their neighbours at all, versus just one in 20 (5 percent) of people in rural communities. Most people (41 percent) say that although they are friendly with their neighbours, they would not socialise with them; however, people in rural communities are far more likely to socialise with their neighbours with over one in five (21 percent) saying that they would versus just over one in 10 in urban areas (11 percent). 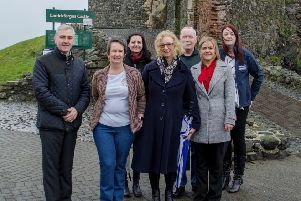 Commenting on the research at the launch of the 11th annual ‘Know Your Neighbour’ campaign, YFCU president, Roberta Simmons said: “As a native of Rathfriland, I know how much those living in rural communities can rely on their neighbours and how important a strong sense of community is. This summer, I’m delighted to be working on this campaign with Calor, asking our members, whether in an urban or rural setting to organise a community event in order for neighbours to get to know one another. Agriculture Minister Michelle McIlveen added: “Being a good neighbour and having good neighbours is very important to all of us at various stages throughout our lives, but it’s especially important for those living in more isolated rural areas. “Young or old, we all appreciate the connection of friendships or just knowing someone is thinking about us, so this scheme is the perfect reminder to offer some support or friendship to those living close to us. Young Farmers’ Clubs of Ulster (YFCU) is calling on communities nationwide to host a local event this summer to encourage neighbours to get to know each other better. Any group or individual planning an event should register for an organiser’s pack at www.knowyourneighbour.ie. The organiser’s pack will include helpful ideas, posters, t-shirts and balloons to help make the event successful.